4-H History was a prominent part of the exhibit area during the National 4-H Agents’ Association meeting last month in Portland, Oregon. Not only were we busy talking with people in our booth but throughout the exhibit hall with invitations and buttons being handed out as well as several cooperative efforts. 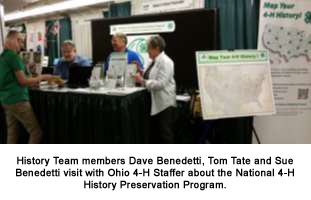 A team of volunteers helped staff both the 4-H History Preservation Program booth and the Esri booth to recruit nominators for the National 4-H History Interactive Map. 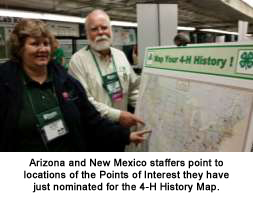 Nearly a hundred new sites were nominated at the conference by filling out forms and adding green pins for the new Points of Interest on the map in the history booth. 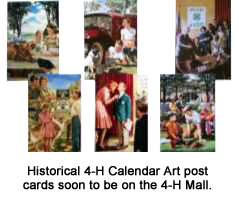 Many lined up to give donations to receive a set of the six newly-printed historical 4-H calendar art post cards which will soon be available for sale on the 4-H Mall. Others signed up to receive the newsletter and the online News Service, more information about the mapping and oral history projects and to offer historic publications and audio-visual materials for digitizing. So many amazing stories were being told that we couldn’t keep track of them all. How could we make sure we didn’t lose these stories next year? Esther Worker of Esri suggested that we talk to next year’s conference planners. They are now exploring a sound booth for taping oral histories at next year’s NAE4-HA conference in New Orleans. One of the most rewarding aspects of this year’s conference were the many people who came by just to say hello, and to tell us that they enjoy using the website and newsletter in their programs. In fact, one of our readers (and newsletter contributor, Jenny Morlock, Ohio) invited us to see her entry in the poster sessions which was inspired by our asking her to share her story about their local 4-H history room in an article we carried in the April 2015 issue of this Newsletter. She used the newsletter as one of her handouts in the display. This entry was posted in History and tagged NAE4-HA 2015 by Sue Benedetti. Bookmark the permalink.